Light Werkes Integrated Tail Lights take your rear turn signals and move them into your tail light. The LED matrix voids the need of ever replacing bulbs! *NOTE*- 2 turn signal wires must be spliced from your stock wiring into the new tail light. Drilling to black plastic fender required. This product installs in around an hour, and requires basic hand tools. This kit relocates your license plate to the rear of your bike, below the tail light. The DMP LED License Plate light is a cost effective way to replace the bulky OEM unit on your motorcycle. This part is designed for use with your stock setup or aftermarket fender eliminator kit. The LED light housing is black to match most motorcycle components and the light shines high intensity white. Two LED lights supplied per package. The DMP Power Grid LED Integrated Taillight provides the perfect solution for streamlining the appearance of your motorcycle by eliminating the bulky rear turn signal housings and incorporating the rear turn signals into the taillight. 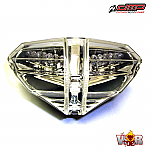 Each DMP Power Grid LED Integrated Taillight lens is formed to perfectly replicate the OEM dimensions and is constructed with high quality polycarbonate for correct optical clarity. Each LED board hosts a matrix of super high intensity LEDs that provide intense luminescence and excellent visibility in a variety of conditions. The interior of the taillight housing contains a topographically designed reflective surface to further amplify the intensity of the LEDs and increase overall visibility. Each DMP Power Grid LED Integrated Taillight comes with a factory type harness to make installation fast and simple. This product is not for use where DOT approval is needed. The DMP Power Grid LED Integrated Taillight is available with a clear or dark smoke lens. Inexpensive insurance against a potential serious injury. In the case of a crash that places your leg near the rear sprocket, the shark guard will help deflect your foot out of harm's way. Other toe guards ask you to drill & tap into your stock swingarm. The average swingarm today is 4-6mm thick aluminum, which can leave you with mounting bolts that can easily strip out. Woodcraft supplies two rivet nut inserts, hex wrench and a friction wrench installation tool with every kit! Please note: To properly install the toe guard the swingarm must have a flat area of at least 16x70mm.